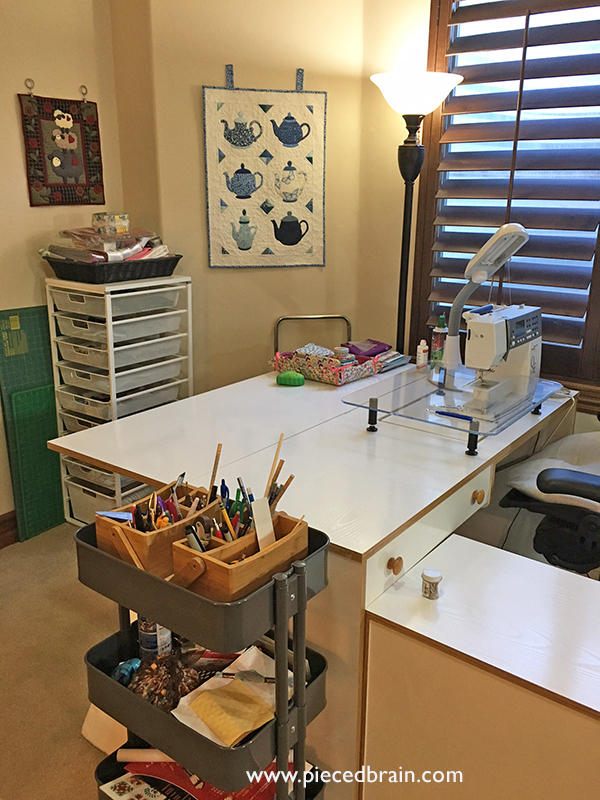 I am ending the year with a clean and organized studio. There a few projects in different stages of completion, as well as others waiting to be started. However, I needed to take time out to regroup and declutter. 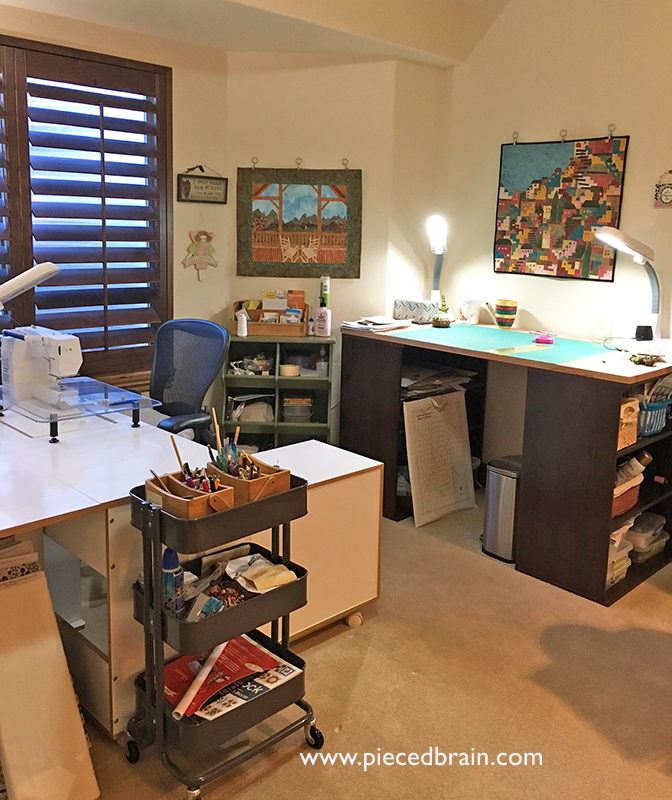 Above is my sewing station and my trusted Bernina. It is time to send it out for maintenance but I am having a hard time parting with it, even for a few days. I clean it often, oil it, etc., which will have to do for the next few weeks. My cutting table is made up of two Ikea book shelves and one Ikea kitchen counter top. 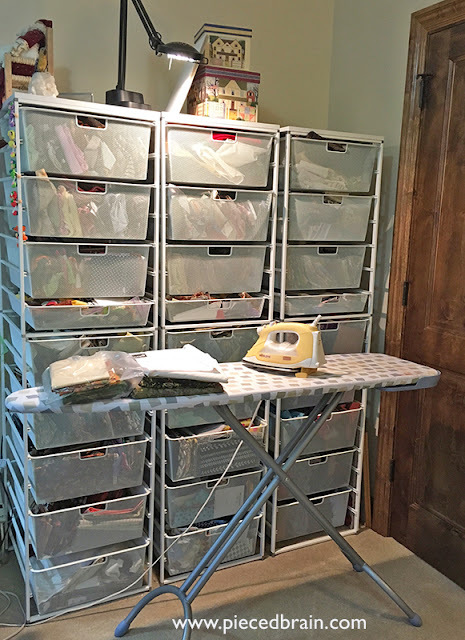 Its height is perfect for me, and all the gadgets are stored in the green wooden shelf unit to the left of it, and in the cart next to the sewing table. All my fabric is stored in these Elfa drawers from The Container Store (they are on sale right now!!!). They are sorted by color, except for the three drawers of wool and two drawers of flannel. The fabrics can breathe and are kept away from dust. This Elfa system is very portable so I can change my studio layout whenever I want. Refolding and resorting the fabrics is my next item in the To Do list. What you see on my ironing table are fabrics for my next two projects - I have a deadline for them so I need to begin asap. 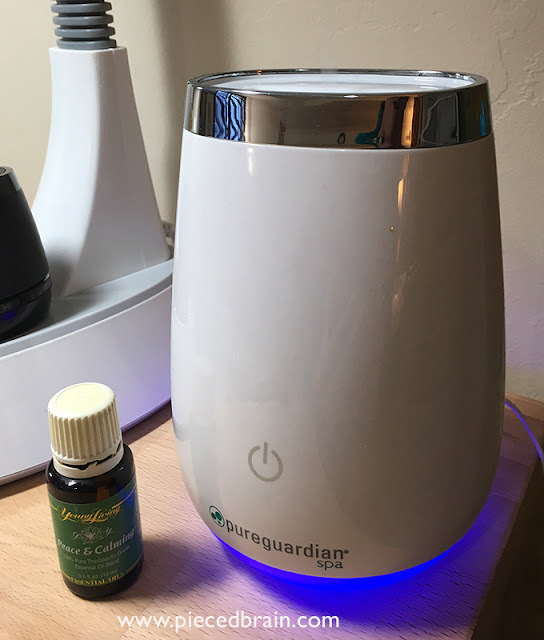 This essential oil difuser is a new addition. I love its silent mist - it turns off after 6 hours or when the water is gone. 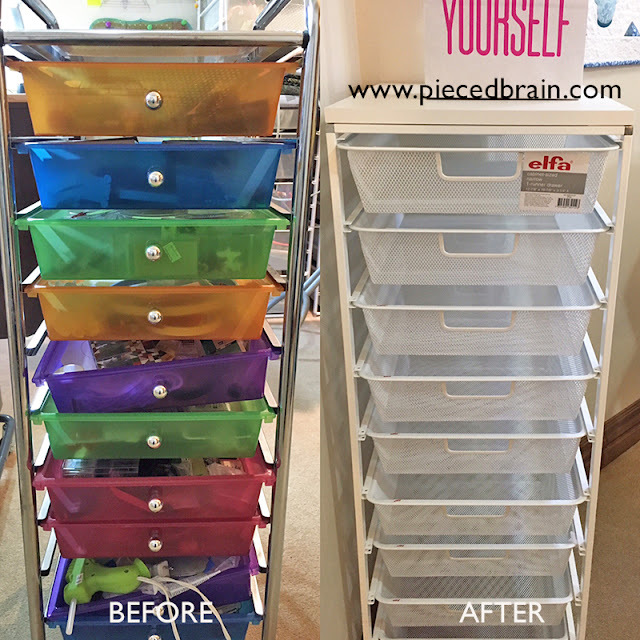 The newest improvement is the Elfa set of drawers for buttons, needles, and other notions which I put together quickly yesterday. Things are looking up! I am now ready for 2017 and am looking forward to try new things. For instance, I am joining Fat Quarter Shop's 2017 Designer Mystery BOM which showcases the Spring-a-Ling fabric collection by American Jane. I am excited about it and will keep you posted of my progress. There are a few patterns coming to my Etsy store and fun giveaways so be sure to check out this blog often. In the meantime, Welcome 2017! Impressive and jealous!! A fresh start to a new year is filled with all sorts of possibilities and an organized sewing room is open to creativity! I see lots coming your way. Is your 3-tiered rolling cart from IKEA? I've seen them painted turquoise/teal, but not dark like yours. Curious!